Your photographs are important to you. From birth to retirement, thru' school and university, engagements and weddings, children and grandchildren, and getting away from it all on holidays - we all love to mark these milestones in our lives by taking photos. These photos tell a unique story of the people and events in your life, which is why it is important to get the most out of your photos of these occasions, ensuring that these memories are preserved for the future. Photographic prints will deteriorate over time and unless you are extremely organised and have lots of storage space, finding, sharing and showing your photos can be a cumbersome and time consuming business. This is where photos2go can help... first we take your photos, slides and negatives and restore their colour and clarity. Then we create a photo montage using enhancing video effects complemented by a soundtrack of your choice. Finally you will have a DVD with personalised menus, case and disks. We tailor make each DVD to suit your individual requirements and budget. We can offer additional services such as conversion to NTSC (North American TV format), VHS Tape Copies and inclusion of video clips. If you have a Widescreen TV we can make use of that extra space allowing much more detail to be shown. DVD Montages can be created in either 16x9 or 4x3 formats. 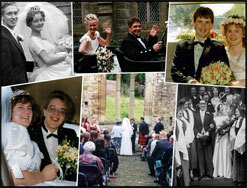 Whatever your choice, we will create a truly personalised montage of memories that will be treasured for ever. photos2go is commited to bringing your photos to life.